Students pose with donated items for the Pet Supply Drive. 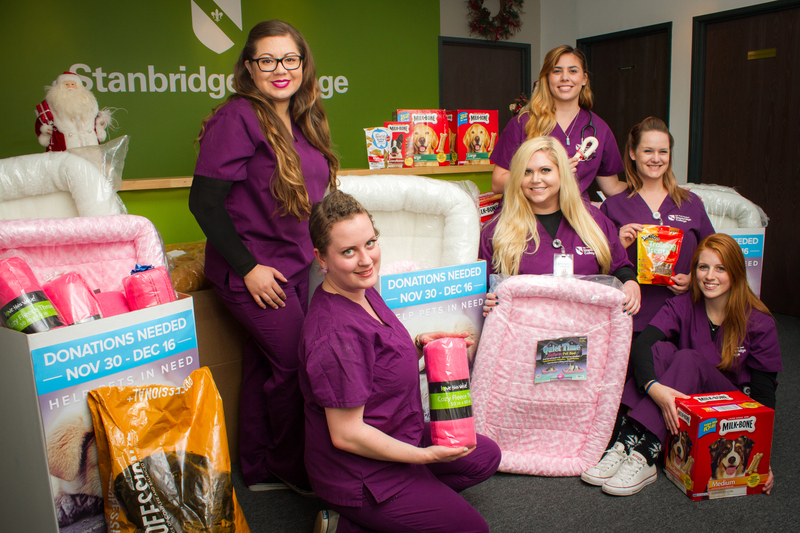 The 2015 holiday season was a busy time at Stanbridge College! Our students, faculty, and staff participated in several long-standing holiday traditions, including collecting gifts for children in need with the Marine Corps Toys for Tots Foundation, and donations of food and supplies for homeless animals through a partnership with the Irvine Pet Complex. From July to November 2015, Irvine Animal Care Center took in 1130 animals and facilitated 785 adoptions to forever homes. At Christmas, over 40 members of the Stanbridge community volunteered to prepare and serve a fresh and warm meal to 250 homeless and other guests at Lighthouse Church in Costa Mesa. After the meal, volunteers handed out over 500 gifts that had been donated by Stanbridge, including rain ponchos, fleece blankets, and warm socks. Stanbridge students also raised funds to buy over 250 bus passes for those in need of transportation and shelter during inclement weather.